David Bordwell (1): Godard: The youngest filmmaker at work today. David Bordwell (2): Just as Hollywood cinema erected rules for plotting, shooting, and editing, it has cultivated rules for “proper” 3D filming. An informative piece by Bryant Frazer points out some ways that Godard breaks those rules. Still, just calling him a maverick makes him sound merely willful. Part of his aim is to explore what happens if you ignore the rules. David Ehrlich (The Dissolve): If Goodbye To Language can be distilled to any one of its many different theses (and that’s a big if), then perhaps it would be helpful to choose the film’s early declaration, “Images murder the present.” Despite the pronounced scene of gunplay, this is a film where the most extraordinary violence is explicitly conceptual. 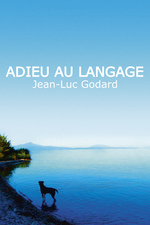 If “Language is the house that man lives in,” as one character famously remarks in Godard’s 2 Or 3 Things I Know About Her, his latest film burns that house to the ground. Matt Zoller Seitz (RogerEbert.com): Watching it is, I would imagine, as close as we'll get to being able to be Godard, sitting there thinking, or dreaming. It's a documentary of a restless mind. Plus, a lot of (most probably not all) works cited in the movie.